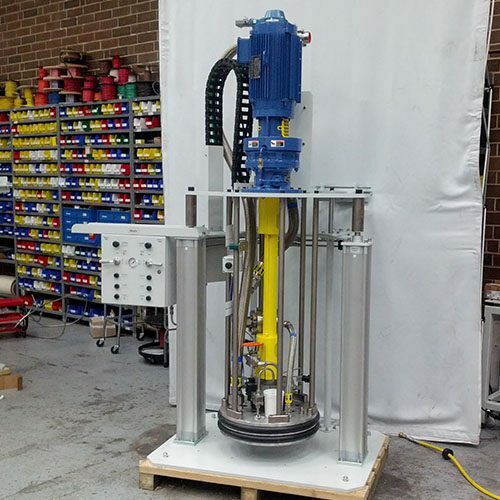 Our Drum Pump Supply Systems include the MarDrum 200 and MarDrum 200 hv that features a quick drum replacement, ergonomic and clean work conditions, and different heating models. These precision-engineered systems are used for the automatic refilling of the buffer tanks for our meter/mix-machine, MarMax and feature two different models designed for various viscosities. 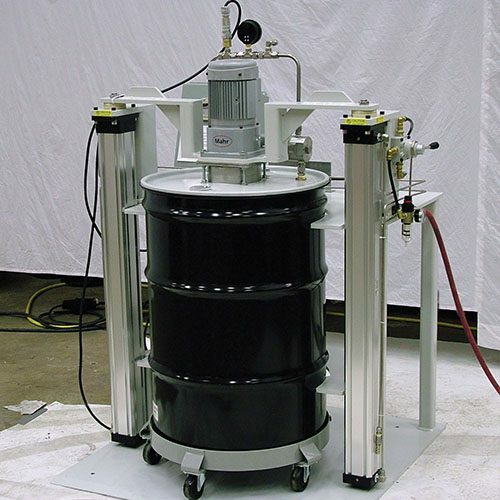 The MarDrum 200 comes in a variety of heating options and is suitable for materials like adhesives, resins, oils, grease, lubricants, and additives. The quick drum replacement increases clean work conditions because the pneumatic lifting device means no manual lifting of the pump. The easy-to-operate equipment also allows drum draining of up to 99% to ensure minimal wasting of materials. The MarDrum 200 hv is available for emptying 200 l drums filled with high viscous liquids. A platen, optionally heated, is pushed onto the surface of the liquid and a gear pump can consequently meter the product. The MarDrum 200 hv allows for inline-viscosity measurement with both flow and temperature control. The machine also features an excentric screw pump with an option of special sealing for filled products. Our durable, German-Engineered products can be used to create fully-customizable solutions to meet virtually any need. Speak with one of our technical experts to create your perfect solution!